During the Perestroika, the Soviet Union was going through its last transitional period. The early signs of decline were so intense and the demands for a change of direction and modernization of the state were increasing. Inevitably the cinema was also dealing with its own crisis. The most important Russian auteurs were in exile so the majority of the films produced were mainly for internal consumption. Karen Shakhnazarov started his career during that time. He filmed many commercial films and he is still today one of the most famous directors in Russia. 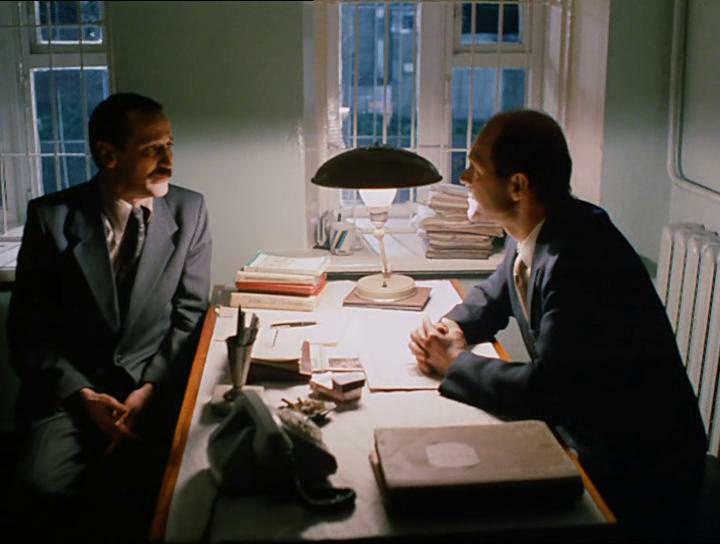 Through his comedy Gorod Zero (Город Зеро / Zero City, 1988), Shakhnazarov is trying to capture the situation of his country and the absurdity that characterized it. Aleksei (Leonid Filatov) is a Muscovite engineer who arrives in a provincial town to visit the local factory that produces air conditioners. The purpose of his trip is to ask a slight modification of an air conditioner’s component. His meeting with the director of the factory is unsuccessful since he can’t get any significant or reasonable answer. As he is preparing for his return to Moscow, he stops at a restaurant and there he will receive a strange gift. A series of unexpected events will captivate him in this small town and it is impossible for him to escape. Gorod Zero is a black comedy that is moving on the limits of the absurd and has strong political and social aspects. Shakhnazarov succeeds to depict a theoretically fantastic and incredible environment which was in fact entirely based on the difficult and boring Soviet reality of the late 80’s. Life was fully incorporated to the rhythms of the ruling bureaucracy that was beyond any logic. All the activities even the simplest ones had to go through an uncommon process and most of the times they ended up as meek transactions. The political delusion of the obvious couldn’t touch any more the everyday life of the citizens. When the people were ready for radical changes, the embalmed state was trying to survive even by using Stalinist tactics. In reality everyone could see that the General Secretary was naked but no one dared to sign and stamp this statement. The sudden freedom was gained so awkwardly during the Glasnost period. As a result both supporters and dissidents got locked into a void time, just like Aleksei was captivated in the provincial Zero town. The title Gorod Zero could have dual translation and interpretation. It may be the Zero City, the city that simply does not exist or where everything is frozen and has been in a stagnant position almost forever. It could also be the City of Zeroes, the starting point of everything, the zero of a new beginning and the vacuum right before the change. Certainly any of these two interpretations could be accurate to describe the USSR in 1988. The inhabitants of the town live with illusions for a past that they never had and they expect an imaginary future that probably will never come. The Russians are also living in a similar lie while they are watching their empire’s disintegration and themselves staying behind the world’s progress. That is the reason why Aleksei is forced to lose his identity. He should be incorporated in this fictional space and pretend to be part of it, otherwise this world, that has become now also his, will collapse and will destroy him too. Shakhnazarov seems that he would prefer to stay loyal to the fantastic part, but strangely he remains closer to the reality. In the screenplay, which is written by him and his almost permanent collaborator Aleksandr Borodyanskiy, absurdity touches the truth. 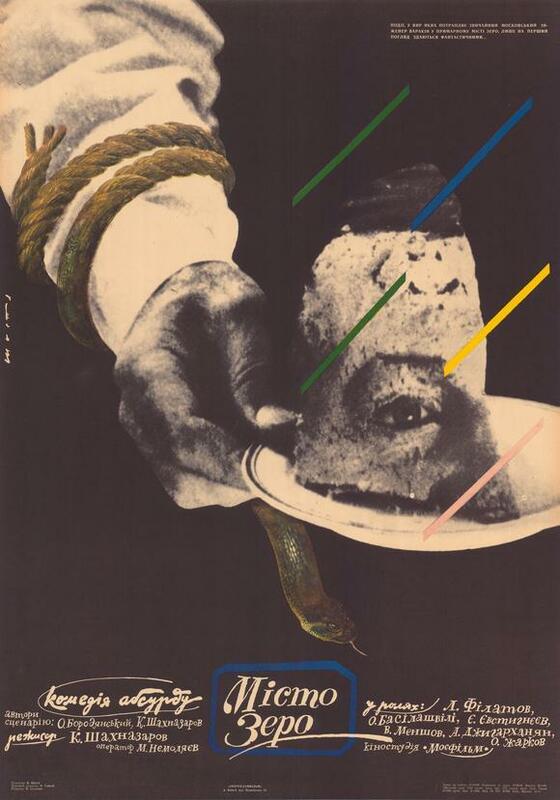 The surreal elements of each situation in conjunction with the suffocating bureaucratic environment inevitably lead coherently to Franz Kafka. This reference in the case of Gorod Zero is quite accurate. The director delivers a pretty convincing film that is not drifted into easy exaggerations. He illustrates distantly and even perhaps cynically the facts and everything seem absolutely natural and normal. Only the viewer and Aleksei feel uncomfortable and are able to distinguish the paranoid system. 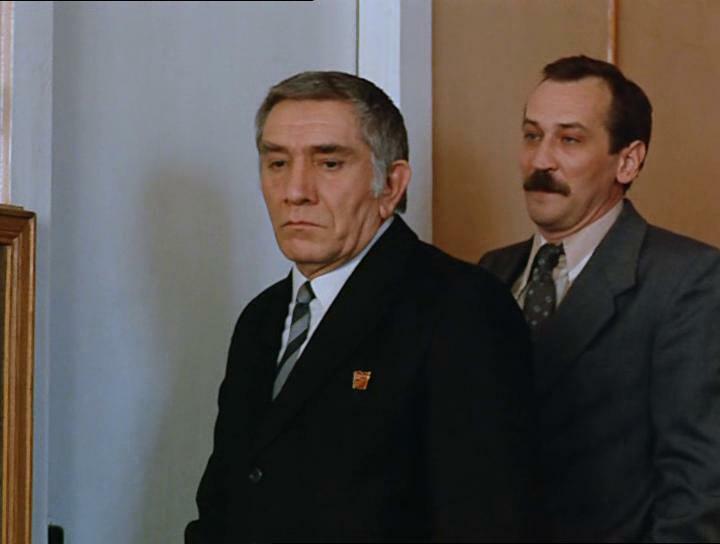 For that observation it is extremely helpful Leonid Filatov’s antihero interpretation that is reaching the limits of deadpan comedy. We should never forget that even Aleksei is simply another System’s victim and that he should go through all the needed procedures. Even when the requirements of the regime surpass any reasonable limit, everyone, especially those who are acting on its behalf, are obliged to surrender to its absurdity. The depicted desperation on Aleksei’s face was also representing many of his fellow citizens. Gorod Zero as an allegorical sociopolitical satire does not give answers to all the raised questions. It has fun with the strange situations and by using self-criticism just wants to give a cheerful tone to the upcoming Loss. The Loss of the state, of the national identity, of the History and even of the Party was then and remains till now a serious issue for the Russians. Even though this is a comedy, perhaps the humor of the film may not be accessible to everyone as it tries with a peculiar ironical way to take itself seriously. So was trying those days the USSR in Afghanistan. Full movie in HD and with English subtitles is available for free by Mosfilm.